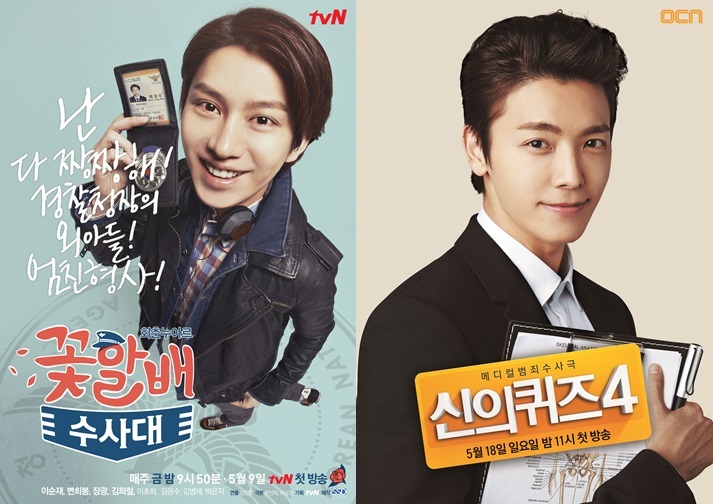 May 12, 2014 – K-Pop idol stars Kim Hee-chul and Donghae of Super Junior have kicked off their respective acting careers on CJ E&M drama programs as cast members on tvN’s Flower Grandpas Investigators and OCN’s Quiz from God (Season Four). On Flower Grandpas Investigators, Kim Hee-chul plays the part of Park Jung-woo, a smart and warm-hearted cop who faces a chaotic atmosphere as he attempts to solve cases with co-workers who have suddenly transformed into 70-year-olds. On the fourth season of hit medical crime drama Quiz from God, Donghae plays Han Siwoo, a researcher and fresh med school graduate who develops feelings for Lim Taekyung (Rainbow’s Jaekyung). Flower Grandpas Investigators airs on tvN every Friday at 9:50PM (KST). The fourth season of Quiz from God will air on OCN every Sunday at 11:00PM (KST) starting May 18.